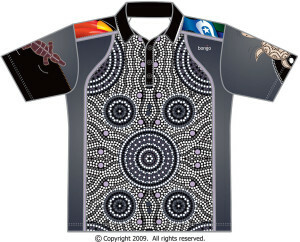 Indigenous Crocodile Turtle Polos feature an Aboriginal dot design with a turtle and crocodile on each sleeve. Art and cultural themes create stunning clothing and convey strong messages. We work with indigenous organisations to create their own design – or use one of our existing designs. We endeavor to fulfill their cultural and artistic requirements. Minimum order for the any of these polo shirt designs is as low as 10 units. We can also add your own logo in this design. To view the intricate design on these shirts double click on the image to see the detail.